We are celebrating our 10th episode with Moms in Prayer President, Sally Burke. She and Lee discuss her Moms in Prayer story, her new book, Start With Praise, and they spill the beans about the 35th Anniversary celebration next year! You’ll love getting to know our dynamic President. a 40 day devotional that will help you learn how to invite God’s power into every area of your heart. 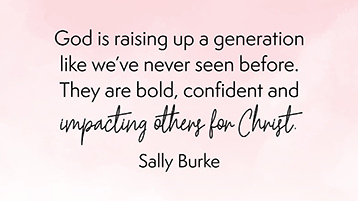 Sally Burke is a dynamic speaker, teacher, author and the President of Moms in Prayer International, a worldwide ministry that equips and encourages women in the transforming power of prayer. Sally is an avid runner, a fast talker, and a fervent lover of Jesus. Sally and her husband Ed have four grown children, two grand kids, and live in sunny California.